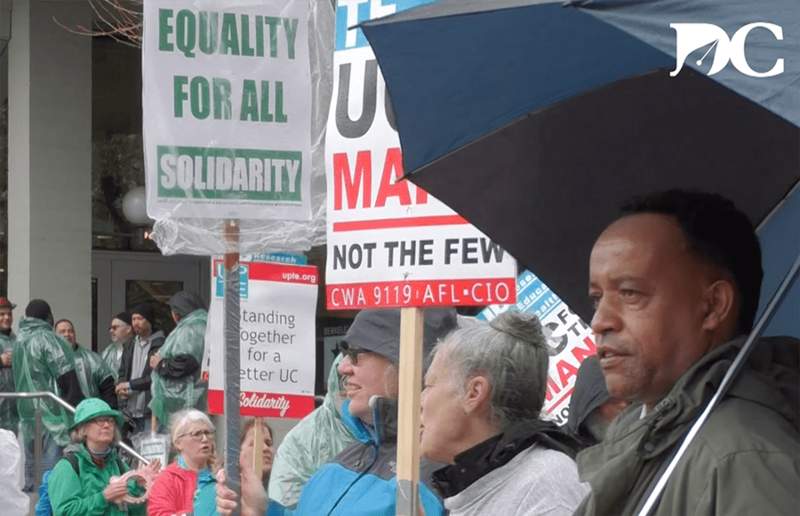 The American Federation of State, County, and Municipal Employees (AFSCME) lead a three-day strike in the streets of Berkeley, fighting against the growing inequality in the UC System. More than 200 UC workers took to UC Berkeley on Monday in a “strike for equality” to protest a forced contract settlement and the alleged unequal treatment of women and people of color. Student academic employees, professors and undergraduate students alike stationed themselves in solidarity at the entrance of Sproul Plaza on the second and final day of a statewide strike against alleged unfair labor practices. The University of California and the union representing its patient care workers came to a tentative contract agreement early Sunday morning, narrowly averting a five-day strike that was scheduled to begin Monday. The University of California and the union representing the largest number of its workers reached an agreement on a tentative labor contract for service workers Wednesday night, ending more than a year of negotiations and canceling a five-day strike planned for next week. Negotiations between the University of California and the union representing its service and patient care workers remained at a standstill Monday, as the union continued to push for wage increases and staffing protections in a counter offer it issued the day before its planned strike vote.